A creme brûlée that is a starter not a dessert? I never knew such a thing existed. Making dishes like this is why being part of French Fridays is so exciting as a cook. Dorie keeps expanding my culinary horizon. Whether or not I or my family likes the dish, the process of learning new cooking techniques and trying new ingredients improves my ability to create recipes. Comte is a mild nutty flavored cheese similar to Gruyere. Honestly, I didn't need to put this delightful cheese in a brûlée to enjoy it. I could have just sat and eaten it with crackers... but I guess this appetizer was all about pizzazz. Yes, we spent $10 bucks at Home Depot and got a mini-propane torch. After my shocking experience with the immersion blender I actually was not too excited to use a torch in the kitchen. So, I let my husband do the honors. He seemed to enjoy himself; though the process took a little longer than we hoped. The cheapy torch kept going out, and my daughter kept stressing that the fumes were going to give us all cancer. We probably should have used the broiler... but we just couldn't resist the element of danger. The resulting appetizer was enjoyed, but not loved. I found it to be a little rich for my taste. None of us are heavy cheesy eaters... but if you are, oh, I so recommend you make this... you will be in heaven. I have a culinary torch, but I just went ahead and threw these under the broiler - it worked out well. The crunchy topping of a brulee is one of the main reasons to eat it, after all! I wish I went with my instinct and just put them under the broiler, but when you have a new toy you want to use it. oh wow! We love creme brulee, and until you posted about it, I've never known it could be anything but a dessert. I might have to make a special trip out of town to find the cheese. I can't even find gruyere anywhere around here. I was surprised I found comte in my grocery store. It is really a great cheese if you can find it. I don't think I've ever tasted salty creme brulee, but I'm pretty sure I'd love it. It doesn't crack like the sugar coated kind which disappointed my kids, but the browned cheese sure tastes good. Now that I've seen yours, Diane, I think I should have broiled mine even more. I wish I had spent the money and purchased some Comté because I would have liked to taste it (after reading your Post). I also have a mini-torch ($20 at Bed, Bath and Beyond) but I'd never used it and since I am now living in a house I no longer own, I don't want to burn it down at this late date!!! So, since Melissa, my daughter, is coming this week-end, she suggested we do it together. Yes, it was rich, rich, rich. Do get a hold of some Comte to me getting introduced to this lovely cheese was the best part of the experience. We really liked this...it was a very different starter to a special meal! It was my first attempt using a "torch" (my husband had one in the garage)but I found it kinda fun :-) I am going to keep looking for Comte cheese, it does sound like a cheese I would like. I think I would have been more excited about the torch if I hadn't had my immersion blender mishap so soon before. The mini torch is pretty tame. As a cheese-lover, I can attest that this was definitely heaven! ;) I wish I could have found Comte to use in this; I had to make do with cheddar. Still, this was so tasty. I love the coloring you got on yours - they look great! Thanks... I didn't realize Comte was so hard to come by... I got it in my grocery store, didn't even have to go to a cheese shop. Good luck looking for it. 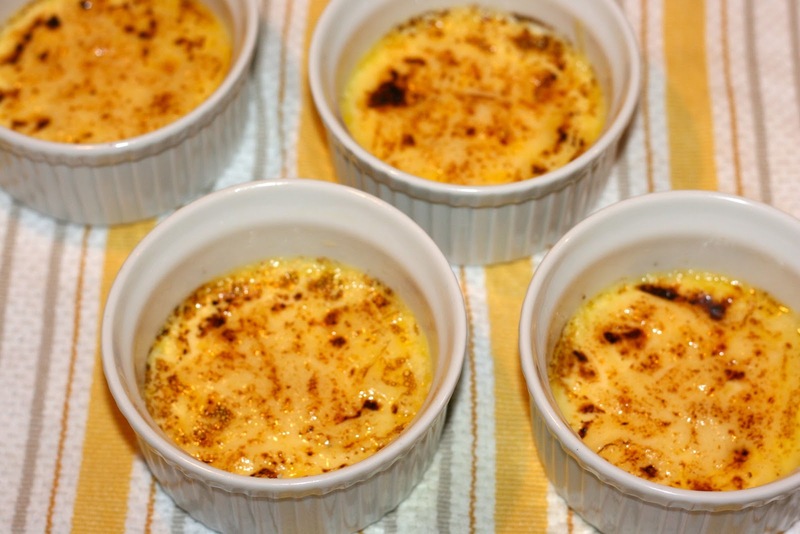 Your Cheesy Creme Brulee looks delicious. Thanks for the tip on Home Depot - I am one my way to get a mini-torch. my favorite part of this dish was the crusty cheesy top. Well, worth 10 dollars if you are only going to use it once in a while. Yes, us Dorista's are a wild bunch: pureeing, blending, torching all kinds of things. I used the broiler, but invested in some new little dishes for this one. I used the cheese I had on hand, but I do love Comte. Honestly, I've never met a French cheese I didn't like... This was definitely rich, but I enjoyed this for a touch of weeknight elegance. Yes, I love those plate and truly is there any bad French cheese? Perfectly lovely Cheesy Brulee, Diane!! I enjoyed these, but I have to say, I like the classic sweet version better! 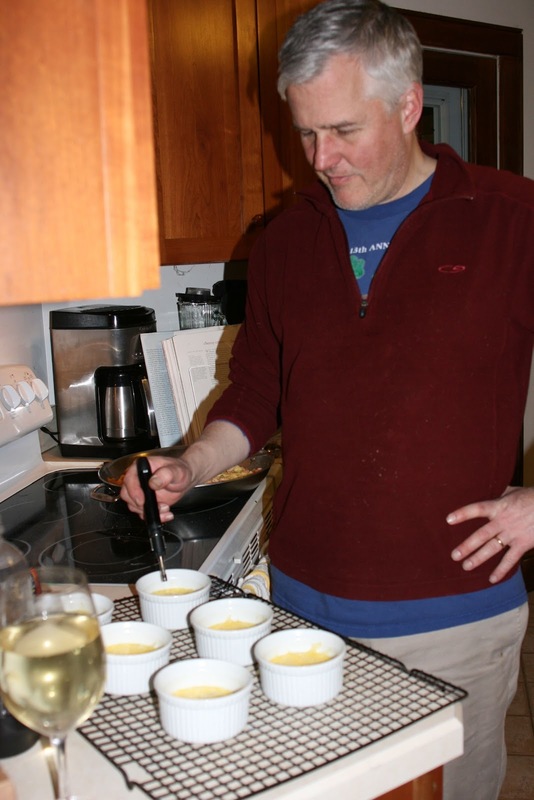 I let my husband do the honors of torching my brulee, too…he’s less prone to accidents than I am. I am looking forward to trying Comte cheese…I haven’t found it by me yet! Well, I won't take for granted my supermarket's cheese selection anymore. Am I the only person who used Comte? The torch may not have been necessary for the cheese version, but will be a good excuse to make some traditional brûlées, soon! Now your talking... I like the dessert version more than this one. You can also make brulee oatmeal. I really like cheese (and cream) and still thought this one was just too heavy. Glad I wasn't the only one! I used the left overs as dips and they went over well. A few bits on a cracker is really all you need.